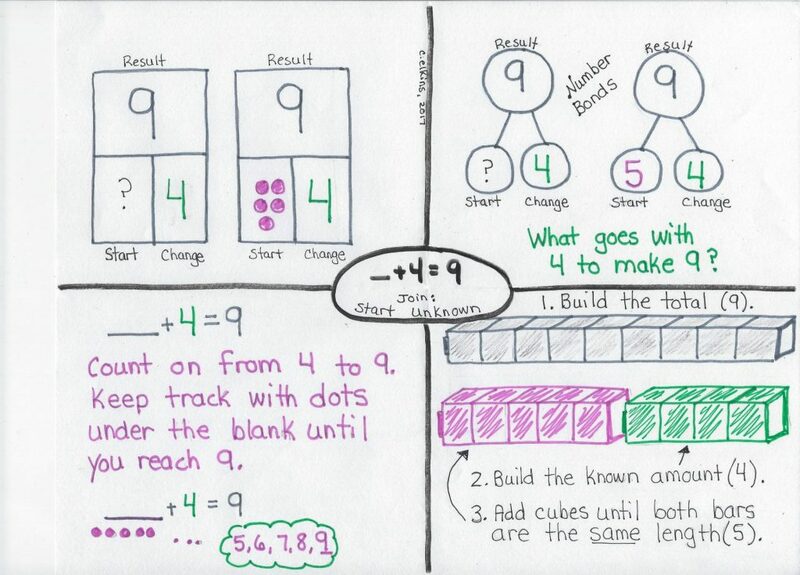 As I promised, here is a post about another multiplication and division story structure. The dinosaur is about twice as tall as the human. The dinosaur is about 12 times wider than the human. Notice some of the questions associated with these stories. 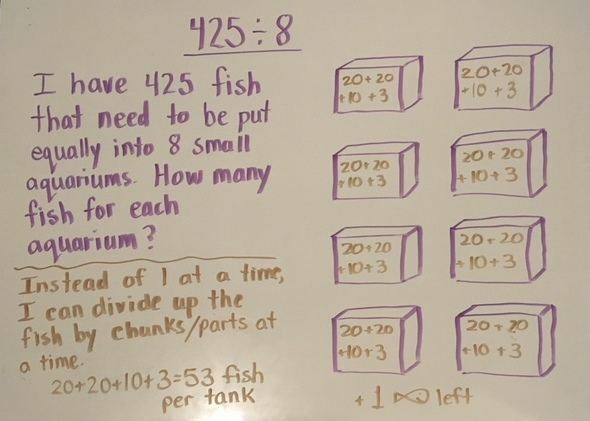 They sound a lot like questions used in other story structures — this is why I advise against statements like, “If it asks how many in all, add the numbers together.” Notice how this method guides a student as they go from pictorial to abstract. You can also represent these types of problems with cubes or money manipulatives if you need a concrete example. This problem shows a multiplying process. Read the problem. Ask who and what this story is about (Joe and Brent – Joe has more $ than Brent). Notice there is no additive or subtractive process, but one has more – the other has less. This is a signal to use comparison bars to help solve. Make a vertical line (to help line up the bars evenly on the left side. 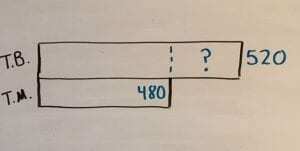 Draw the bar with the known amount. (Joe has $22.) Label the second bar (Brent). 3. 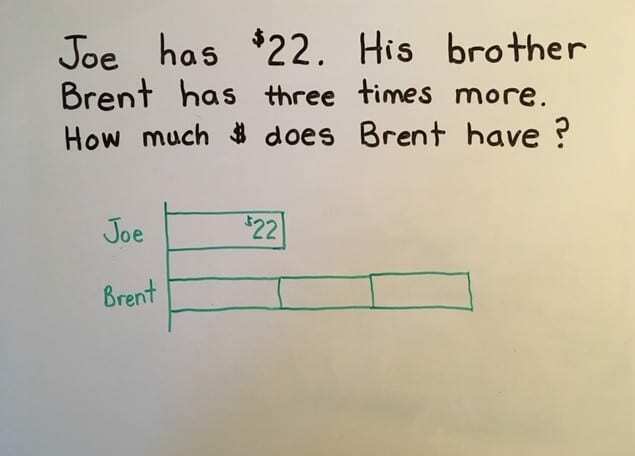 Since the story said Brent has 3 time more, draw 3 bars equal to the size of Joe’s bars. 4. 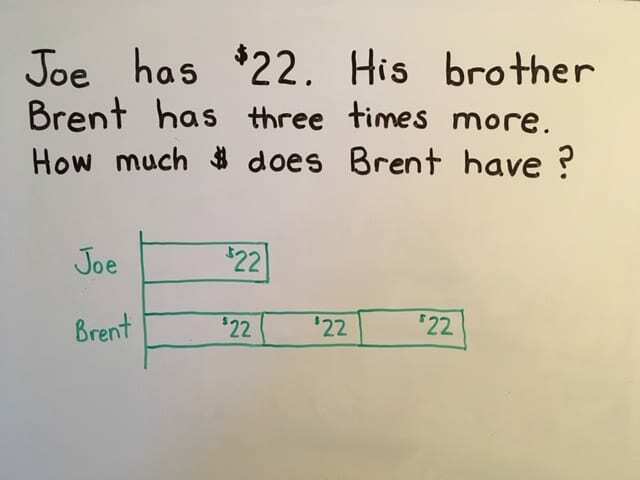 Since Joe’s bar is $22 and the bars by Brent’s name are equal in size, all of Brent’s bars should be labeled with $22. 5. 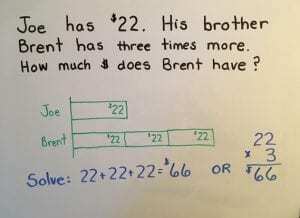 To find out how much Brent has, solve by repeated addition or multiplication. 6. 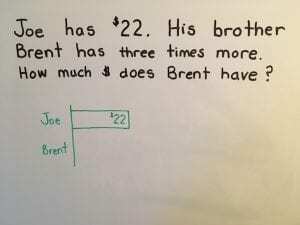 IF the question was slightly different (How much do Joe and Brent have all together? ), then the above steps would have to be followed by 1 more step (adding the two amounts together). 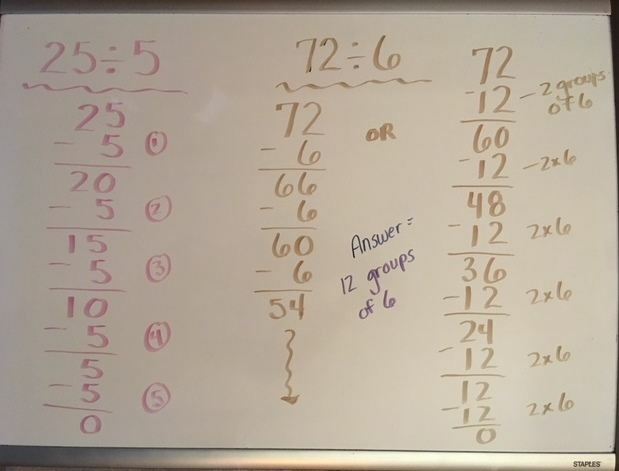 * If students had been taught earlier to “Add when the question asks How many in all” then the child would likely add $22 + 3 to get their answer. That signals no conceptual understanding of what the problem is all about: One has more, the other has less. Pictured here is an illustration of the strategy which can be used for multiplication and division problems. 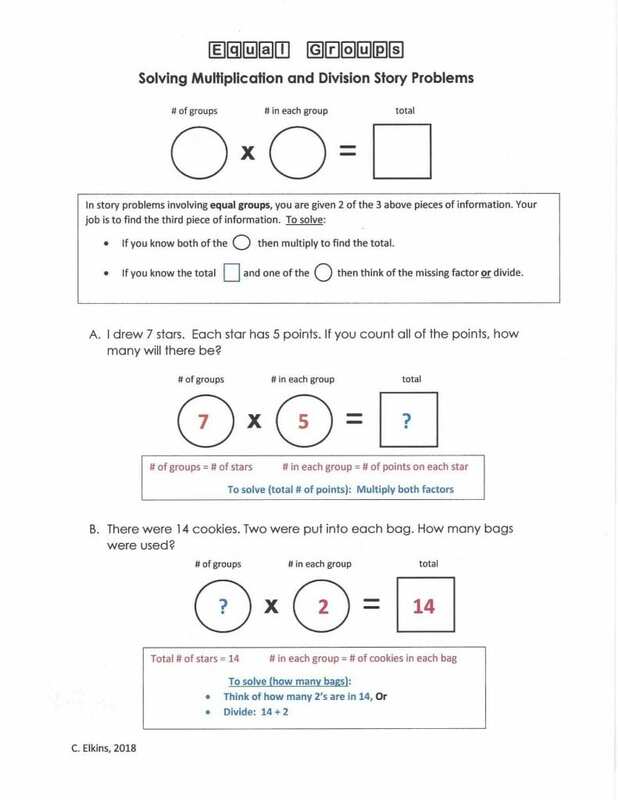 Get my FREE packet right here: Equal groups strategy with template. 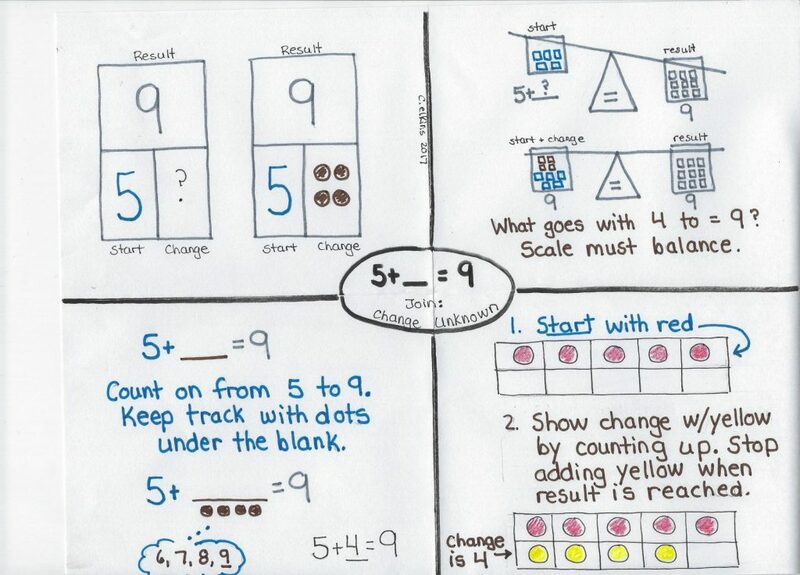 Solving comparison problems involves a different thinking process than addition or subtraction problems. In my previous posts Math Problem Solving Parts 1 and 2, I focused on addition and subtraction problems in which I advised students to think of the verbs used (found, bought, earned, spent, lost, gave away, etc.) to help visualize what is going on in the story. In comparison problems, there are no additive or subtractive processes present – just analyzing which has more, which has less, and how much more or less one amount is compared to another. I love using a double bar method for comparison problems. 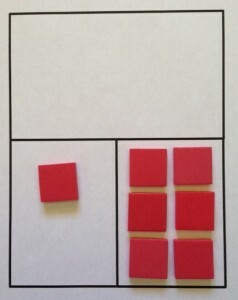 It can be represented with manipulatives for a concrete experience (ex: connecting cubes, tiles) or with a drawing of two rectangular bars for a pictorial representation. These two visual models provide students with the concept of comparison — they can see right away which has more, which has less. Then the information can be used to compare the two amounts. Look for the FREE resource at the end of this post. I recommend the use of manipulatives when dealing with students’ first experience with comparison problems. Dealing with quantities less than 20 make using manipulatives manageable. I will show this in a horizontal format, but it can certainly be done vertically. You can also apply this quite well to graphing problems. Problem: I have 12 crayons. My friend has 8 crayons. How many more crayons do I have than my friend? 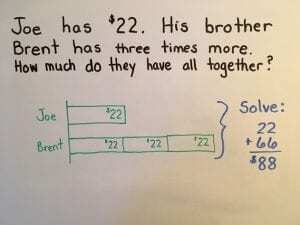 Determine that this problem is not an addition / subtraction process (because no one is adding to what they have and no one is giving away what they have), but in fact a comparison problem. Be cautious about focusing on the question”how many more” and telling students that when they see this they need to subtract. 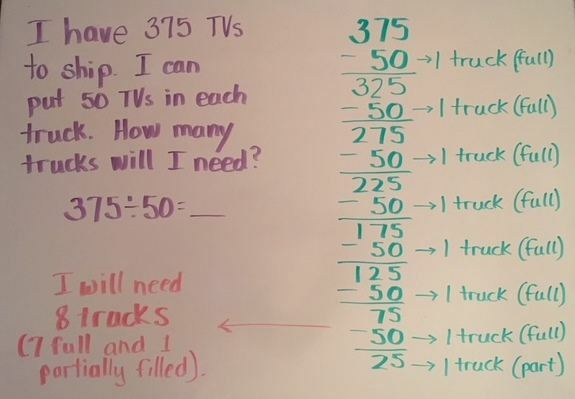 When we tell kids to focus on the specific words in a question with a “rule” for adding or subtracting, they start to lose sight of the actual story. Consider that this question can also be used with a SSM (some and some more) story which is not a comparison problem: What if it read: “I have 8 nickels. I want to buy a candy bar that costs 80 cents. How much more money do I need?” This story means: I have some (40 cents) and I need some more (?) so that I have a total of 80 cents. This is a missing addend or change unknown story: 40 + ___ = 80. Even though it could be solved in a similar manner as a comparison story, we want students to be able to tell the difference in the types of stories they are solving. Determine who has more (represented by yellow tiles), who has less (green tiles). Count up from 8 to 12 to find the difference. Even if the question was “How many fewer crayons does my friend have?” it would be solved the same way. 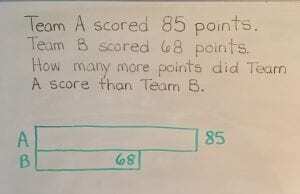 Problem Type 1 (Both totals known): Team A scored 85 points. Team B scored 68 points. How many more points did Team A score than Team B? Determine this problem is not an addition / subtraction process (because the teams are not gaining or losing points). Ask “Who?” and “What?” this story is about: Team A and B and their scores. Draw double bars (one longer, one shorter) which line up together on the left side. Label each bar (Team A, Team B). For the team with the larger amount (Team A), place the total outside the bar (85). For the team with the smaller amount (Team B), place the total inside the bar (68). Make a dotted line which extends from the end of the shorter bar upward into the longer bar. Put a ? inside the extended part of the longer bar. This is what you are trying to find. 68 + ____ = 85 This choice might be preferred for those with experience using mental math or open number lines to count up. In the previous post, I addressed problems dealing with an additive process (join; aka SSM). In this post, I will show you some models to use for these types of problems: Separate; aka Some, Some Went Away — SSWA. I will share some models which are great for KG stories as well as templates that are helpful for intermediate students to use, especially when dealing with missing addend types. As I previously mentioned, it is my belief that students should focus more on the verb / action in the story and not so much with the key words we often tell kids to pay attention to. Brainstorm actions that signify a subtractive process. Post it in the class. Keep adding to it as more actions are discovered. With this subtractive action, kids should quickly realize that there should be less than we started with when we take something away. 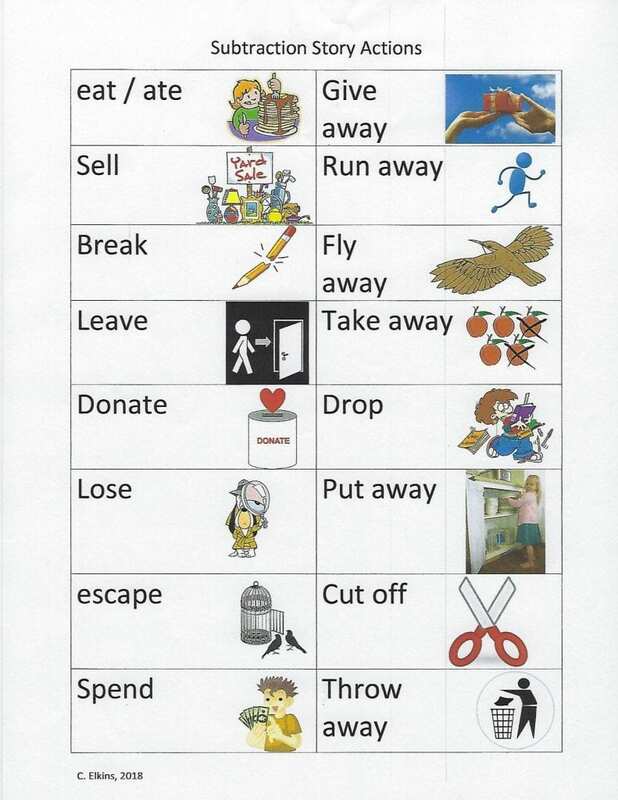 Here is a FREE poster showing some of the most common subtraction action verbs. Click HERE to get your copy. Like with all story problems, I model how I reread the problem several times. Second read –Identify who and what the story is about (the action). Third read — Decide what to do with the numbers. Is a given number the whole / total amount or part of the amount? Do I know how the story started? How it changed? The result? I have 1 penny in one pocket. I have 6 more pennies in another pocket. This is a Join or “some and some more” story structure. Many teachers I work with have asked for advice on problem solving in math. Students often don’t know how to approach them or know what operation to use. Should teachers help students focus on key words or not? What about the strategies such as CUBES, draw pictures, make a list, guess and check, work backwards, find a pattern? While all of those strategies definitely have their purpose, I find we often give kids so many steps to follow (underline this, circle this, highlight that, etc.) that they lose sight of what the problem is basically about. 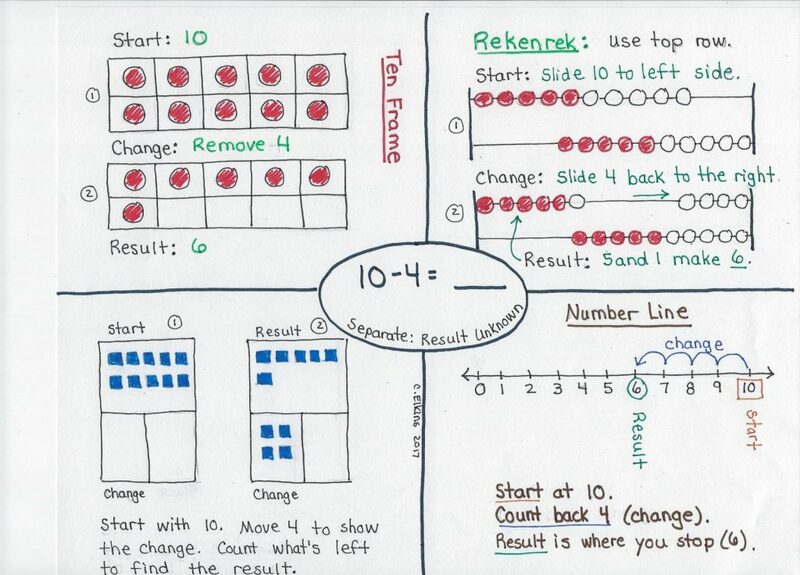 In this post, I will focus on two basic questions (who and what) and a simple graphic organizer that will help students think about (and visualize) the actions in a one-step Join story problem. 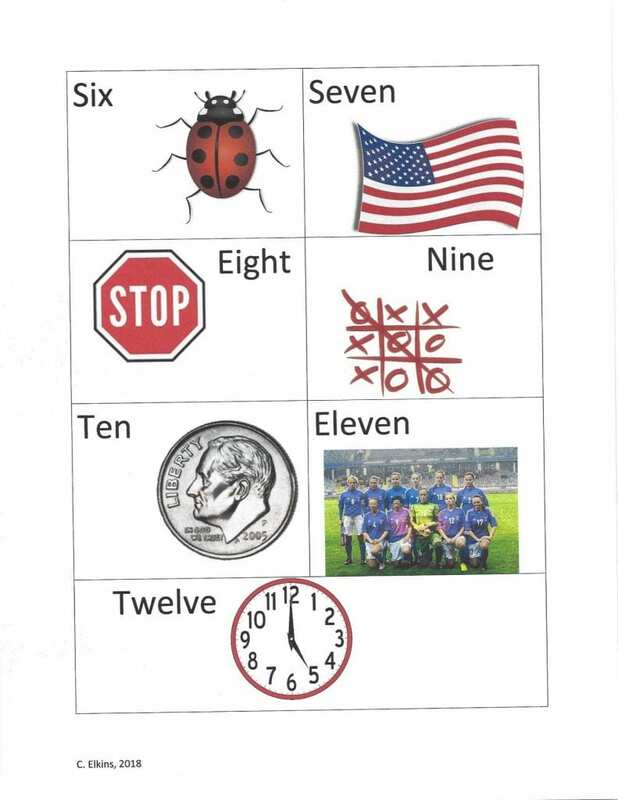 KG and first grade students can act out these actions using story mats or ten frames. 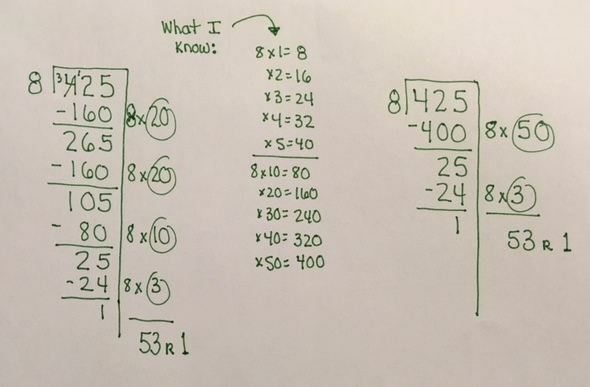 Late first through 5th grade can use a part-part-whole box. There are two FREE items offered. These are the types of problems I will focus on in the next few posts. Is division a dreaded topic on your list of objectives to teach? Like many math topics, students have a harder time understanding it most likely because it’s not something they use regularly in their lives. Students should understand why division is useful before they have to start solving division problems. 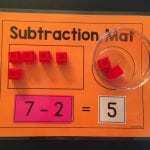 In this post, I will focus on helping students see the relationship between subtraction, multiplication, and division both with concrete objects, pictures, and the partial quotients model. Freebies available below!! Then let’s talk about what division really is — it is repeated subtraction; much the way multiplication is repeated addition. The issue is that repeated subtraction is not always very efficient. Here’s what I mean. Let’s say I have the basic problem 25 ÷ 5. I could start with 25 and then subtract 5, subtract another 5, another 5, another 5, and another 5 until I run out and reach zero. I would have to do this 5 times. If I had 25 cookies that I wanted to share equally among 5 friends, I could do the “one for you, one for you, one for you, one for you, and one for you” process and still end up with 5 cookies for each. Or I could try “two for you, two for you,” etc. to make the action of passing out the cookies faster. When I get down to 5 cookies, I return to the “one for you . . .” to make it work. This week I will focus on subtraction problem structures. There are two types: separate and compare. I suggest teaching these models separately. Also, some part-part-whole problems can be solved using subtraction. I will refer to the same terms as in addition: start, change, result. You can also use the same materials used with addition problems: part-part-whole templates, bar models, ten frames, two-color counters, number lines, and connecting cubes. Example: 10 – 4 = ____; There were 10 cookies on the plate. Dad ate 4 of them. How many are left on the plate? Explanation: The problem starts with 10. It changes when 4 of the cookies are eaten. The result in this problem is the answer to the question (how many are left on the plate). Draw a picture to show the starting amount. Cross out the items to symbolize removal. Show the problem in this order also: ____ = 10 – 4. 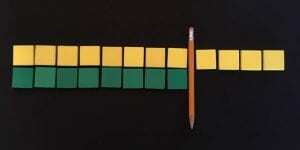 Remember the equal sign means the same as — what is on the left matches the amount on the right of the equal sign. 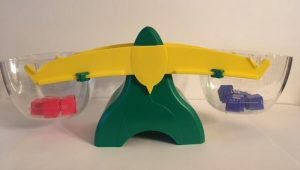 Teach your students the equal sign means “the same as.” Think of addition and subtraction problems as a balance scale: what’s on one side must be the same as the other side — to balance it evenly. Let’s look at the equal sign’s role in solving the different addition / subtraction structures. I will be using the words start to represent how the problem starts, the word change to represent what happens to the starting amount (either added to or subtracted), and the result. 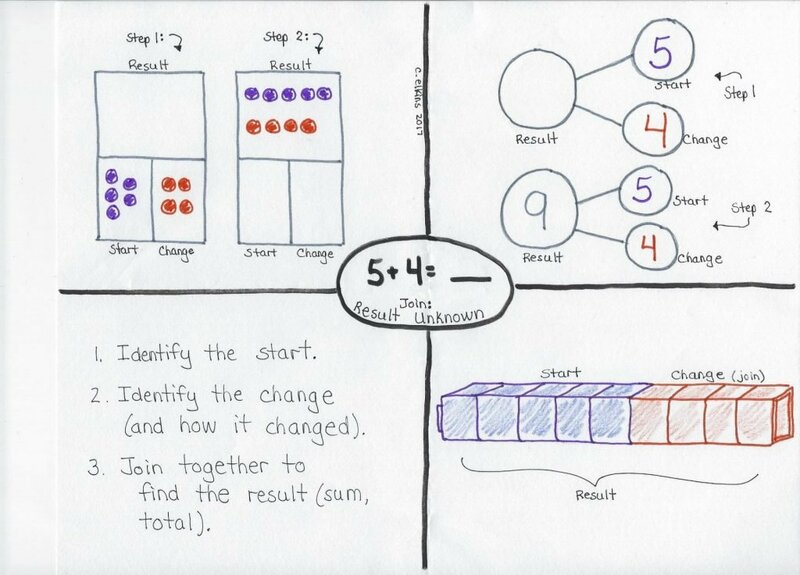 In this post I will be addressing the join / addition models of Result Unknown, Change Unknown, Start Unknown and Part-Part-Whole. I will highlight the subtraction models (Separate and Comparison) next time. Knowing these types of structures strengthens the relationship between addition and subtraction. Three of these addition models use the term join because that is the action taken. There are some, then some more are joined together in an additive model. One addition model, however, is the part-part-whole model. In this type there is no joining involved – only showing that part of our objects have this attribute and the other part have a different attribute (such as color, type, size, opposites). 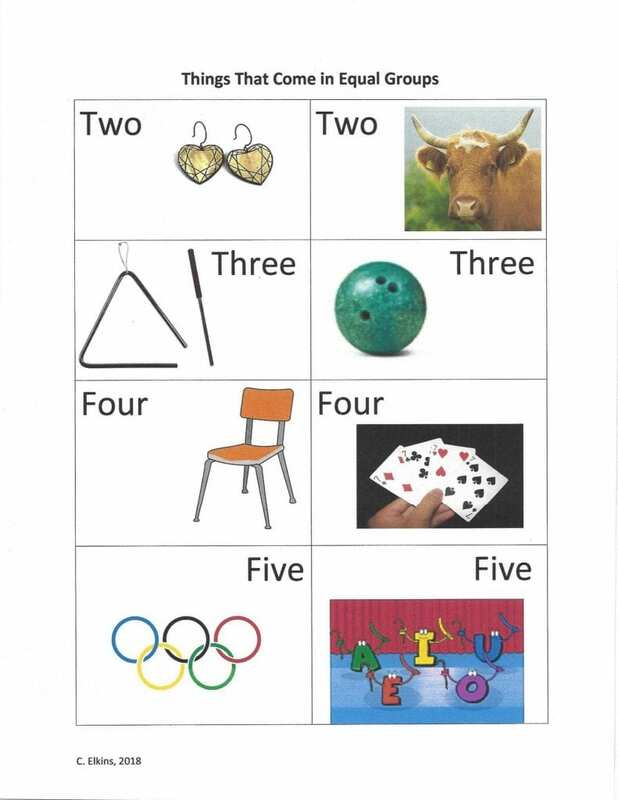 Example: 5 + 4 = ____; A boy had 5 marbles and his friend gave him 4 more marbles. How many marbles does the boy have now? Explanation: The boy started with 5 marbles. There was a change in the story because he got 4 more. The result in this problem is the action of adding the two together. Common questions: How many now? How many in all? How many all together? What is the sum? Example: 5 + ____ = 9; A boy had 5 marbles. His friend gave him some more. Now he has 9 marbles. How many marbles did his friend give him? You could also call this a missing addend structure. Explanation: This problem starts with 5. There is a change of getting some more marbles, but we don’t know how many yet. The result after the change is (9). It is very likely students will solve like this: 5 + 14 = 9. Why? Because they see the equal sign and a plus sign and perform that operation with the 2 numbers showing. Their answer of 14 is put in the blank because of their misunderstanding of the meaning of the equal sign. Count up from the start amount to the total amount. This will give you the change involved in the story. Example: ____ + 4 = 9; A boy had some marbles. His friend gave him 4 more. Now he has 9. How many did he have to start with? Explanation: The boy had some marbles to start with, but the story does not tell us. Then there is a change in the story when his friend gives him some more (4). The result is that he has 9. Count up from 4 to 9.